Hungry for Knowledge is the largest cross-campus study on student food insecurity in Canada, to date. The report collected data from post-secondary students regarding their financial access to food, the barriers that limit access, and the physical, emotional, and social impacts on our youth. 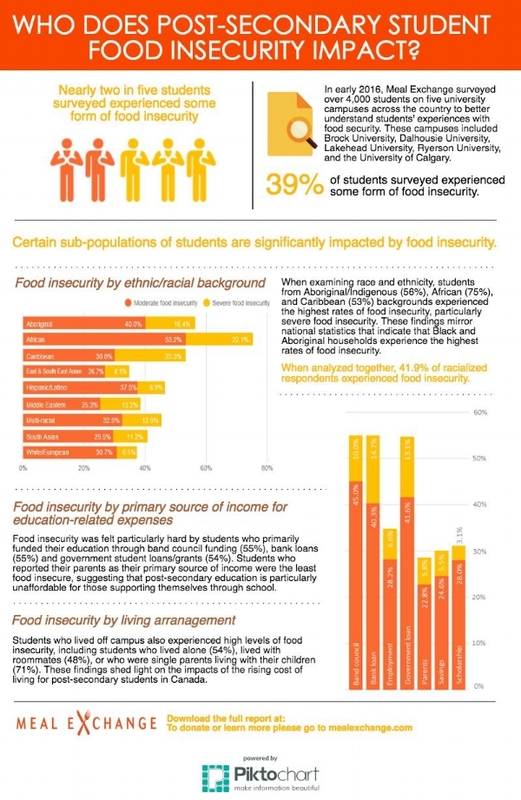 The findings suggest that food insecurity is a serious issue for post-secondary students in Canada, with nearly two in five (39%) of surveyed students experiencing some degree of food insecurity in the past year. Contact Merryn at merryn@mealexchange.com to learn more about how Meal Exchange can support you to run a Hungry for Knowledge survey on your university or college campus.